??? ~ 1849: born in Kamigata, he started his career as a disciple of Ichikawa Ebijûrô IV and took the names of Ichikawa Tôtarô and Ichikawa Benisuke I at unknown times. 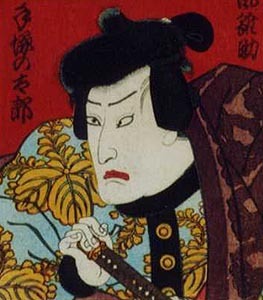 1849: Ichikawa Benisuke took the name of Kanô Hinasuke IV. 2nd lunar month of 1858: he settled in Edo and took the prestigious name of Arashi Hinasuke VI at the Nakamuraza, performing in the drama "Date Moyô Somete Kisaragi". 3rd lunar month of 1859: Hinasuke played at the Moritaza the roles of Sagenji and Jûsaburô in the drama "Tanomimasu Soga no Kamigaki". 5th lunar month of 1859: Hinasuke played at the Moritaza the role of Otatsu in the drama "Zôho Natsu Matsuri Otoko Kagami" (a play similar to "Natsu Matsuri"); his stage partners in the roles of Danshichi Kurobê, Issun Tokubê and Tsuribune Sabu were Nakamura Fukusuke I, Ichikawa Kuzô III and Ichikawa Danzô VI. Hinasuke also played the roles of Oda Harunaga and Mashiba Hisayoshi in the drama "Toki-ha Ima Kikyô no Hataage". 7th lunar month of 1859: Hinasuke played at the Moritaza the role of Karukaya Dôshin in the drama "Zôho Tsukushi no Iezuto". 3rd lunar month of 1860: Hinasuke played at the Moritaza the roles of Jûbê, Shôroku and Busuke in the drama "Hana Gatami Gojûsan Tsugi" (similar to "Igagoe Dôchû Sugoroku"). 11th lunar month of 1860: Hinasuke played at the Moritaza the role of Munesada in the dance-drama "Tsumoru Koi Yuki no Seki no To"; his stage partners were Ichikawa Shinsha I (Kurozome), Sawamura Tanosuke III (Komachi) and Nakamura Shikan IV (Kuronushi). 8th lunar month of 1861: premiere at the Moritaza of Kawatake Shinshichi II's drama "Sakura Sôshi Gonichi no Bundan", a revised version of Segawa Jokô III's drama "Higashiyama Sakura Sôshi"; Hinasuke played the roles of Ashikaga Yoshimasa and Kamimura Hayato [casting]. 10th lunar month of 1861: premiere at the Moritaza of Segawa Jokô III's drama "Zôho Futatsu Domoe"; Hinasuke played the roles of Oda Harunaga, Urabe Suetake, Junrei Tanesaku and Gunsuke [casting]. 8th lunar month of 1862: premiere at the Moritaza of Kawatake Shinshichi II's drama "Kanzen Chôaku Nozoki Garakuri"; Hinasuke played the roles of Fujikake Dôjûrô and Ôdate Samanosuke [casting]. 10th lunar month of 1862: Hinasuke played at the Moritaza the roles of Shirokiya Shôbei and Enrakushi Yojirô in the drama "Takurabete Azuma Hakkei". He also played the role of Hachiman Tarô in the "Sodehagi Saimon" scene of the drama "Ôshû Adachi-ga-Hara". 3rd lunar month of 1863: Hinasuke played at the Moritaza the roles of Naganuma Kenmotsu, Gion no Okaji and Kikuchi Hyôgonosuke in the drama "Keisei Omokage Zakura". 1st lunar month of 1864: Hinasuke's rank in the Edo hyôbanki, tachiyaku section, was jô-jô-kichi (superior - superior - excellent). 9th lunar month of 1864: Hinasuke went back to in Ôsaka. He played at the Naka no Shibai the roles of En'ya Hangan, Hayano Kanpei and Jûtarô in the classic "Kanadehon Chûshingura"; his stage partners were Arashi Kichisaburô III, Nakamura Jakuemon I, Jitsukawa Enzaburô I and Ogino Senjo. 1st lunar month of 1865: Hinasuke's rank in the Ôsaka hyôbanki, tachiyaku section, was jô-jô-kichi (superior - superior - excellent). 7th lunar month of 1865: Hinasuke played at the Horie no Shibai the roles of Oda Harunaga and Konoshita Tôkichi in the drama "Shusse Ukejô". 3rd lunar month of 1866: Hinasuke played at the Chikugo no Shibai the roles of Yuranosuke and Jûtarô in the classic "Kanadehon Chûshingura". 3rd lunar month of 1867: Hinasuke played in the same theater the role of Iwafuji in the drama "Kagamiyama Hana no Sugatae". 9th lunar month of 1867: Hinasuke played at the Tenma no Shibai (Ôsaka) the role of Owari Dennai in the drama "Katakiuchi Ura no Asagiri". 3rd lunar month of 1868: Hinasuke became zagashira at the Chikugo no Shibai and played the roles of Takechi Mitsuhide, Ano no Tsubone and Keikaku in the drama "Ehon Taikôki". 4th lunar month of 1868: Hinasuke settled in Kyôto. He played at the Minamigawa no Shibai the role of Takechi Mitsuhide in the drama "Ehon Taikôki". 9th lunar month of 1868: Hinasuke went back to Ôsaka. He played at the Horie no Shibai the role of Abe no Sadatô in the "Sodehagi Saimon" scene of the drama "Ôshû Adachi-ga-Hara"; his stage partners were Nakamura Sôjûrô (Sodehagi), Jitsukawa Enjaku I (Abe no Munetô) and Nakamura Kanjaku III (Hachiman Tarô). 11th lunar month of 1868: Hinasuke played in Kyôto at the Minamigawa no Shibai the role of Abe no Sadatô in the "Sodehagi Saimon" scene of the drama "Ôshû Adachi-ga-Hara". The casting was the same as the Ôsaka performance. 10th lunar month of 1869: Hinasuke played at the Chikugo no Shibai the role of Chiyo in the classic "Sugawara Denju Tenarai Kagami"; the role of Matsuômaru was played by the Edo actor Bandô Hikosaburô V.
10th lunar month of 1870: Hinasuke played in the same theater the role of the old woman Koshiji in the "Takenoko Hori" scene of the drama "Honchô Nijûshikô"; his stage partners were Jitsukawa Enjaku I (Yokozô) and Nakamura Kanjaku III (Jihizô). 3rd lunar month of 1871: Hinasuke played in the same theater the roles of Yuranosuke, Kazuemon, Gengoemon and Nuinosuke in the drama "Appare Chûshin Homare no Ishizue". 4th lunar month of 1871: Hinasuke played in the same theater the role of Rokuyata in the drama "Ichi-no-Tani Futaba Gunki". 9th lunar month of 1871: Hinasuke played in the same theater 4 roles in the drama "Chûkô Homare no Futamichi". 1st lunar month of 1872: Hinasuke appeared on stage for the last time, at the Chikugo no Shibai, playing the role of Shigetada in the drama "Dan no Ura Kabuto Gunki"; his stage partners were Ôtani Tomoemon V (Akoya), Arashi Rikan IV (Iwanaga) and Jitsukawa Enjaku I (Hanzawa Rokurô). 2nd lunar month of 1872: Hinasuke died in Ôsaka. Arashi Hinasuke VI was a talented kaneru yakusha, who achieved fame for himself in both Edo (1858~1864) and Ôsaka (1864~1872). He excelled in jidaimono dramas.